Economics use many abbreviations to study National Income. 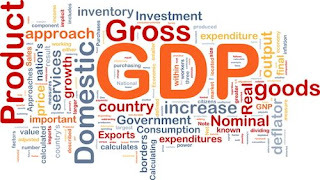 One of the most common is GDP, which stands for Gross Domestic Product. It is widely used as reference point for the measurement of the health of the National and Global Economies. GDP measure the monetary value of final goods and services i.e. those that are bought by final user, produce in a country in a given period of time(say a quarter or a year). It count all the output generated within the border of a country. GDP is composed of good and services produced for sale in the market and also include some non-market production, such as defence or education services provided by the government. The word Gross means, no deduction in made for the value of expenditure on capital goods for replacement purposes. Income arising from investment and projections owned abroad is not included, only the value of flow of goods and services produced in a country is estimated. Hence, the world Domestic is used to distinguish it from the GDP. But in a closed economy. where,(R-P)=Net Factor Income from Aboard. It refer to the total value of all the goods and services at market price produced during a year within the geographical boundaries of the country. Market price refers to the actual transacted price and it include indirect taxes such as excise duty .VAT, service tax custom duty etc and government subsidies. That's why the GDPMP (in ₹) has steadily increased in the last decades. GDP can be calculated at factor cost. This measure more accurately reveals the income paid to factors of production. The factor cost means the total cost of all factors of production consumed or used in producing a good or service . It include government grants and subsidies but it excludes indirect taxes. The difference between market price(MP) and cost price(CP) is because of indirect taxes and subsidies. GDPFC=GDPMP- Indirect Taxes and Subsidies. In terms of value addition, the Gross Domestic Product(GDP) of economy is the sum of total of net value added and depreciation of all the firms of the economy. Nominal GDP is evaluated at current market price. Therefore, nominal GDP will include all the changes in the market price that have occurred during the current year due to inflation or deflation. Real GDP is better measurement of GDP, since it reflects the increase in quantity of goods and service by adjusting for any increase in price. The value of economic output adjusted for the price changes (i.e. inflaion or deflation) in Real GDP. So, the price of growth of Real GDP has increased and decreased in the last decades. Real GDP is generally measure using base year prices of goods and services .